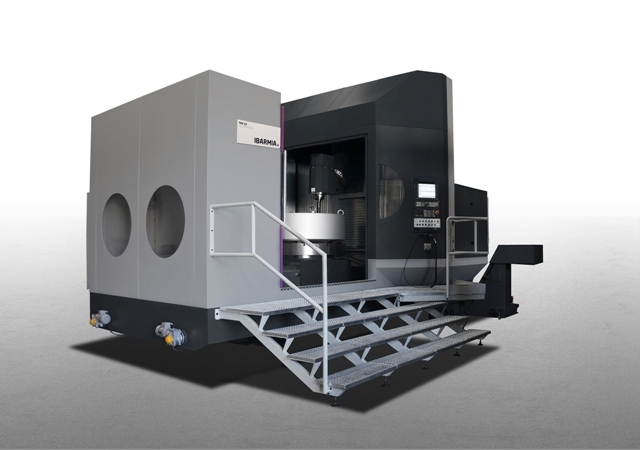 IBARMIA presents its latest and most advanced development in multi-task machining centres (milling/lathing) with universal headstock, continuous rotation and rototranslating bed for work on 5 axes/5 sides of complex parts, more commonly known as 22/MULTIPROCESS. This is the largest model within the IBARMIA T Series. Universal Machining Centres with moving column and bed to machine the most challenging parts with great precision and speed. With linear travels of X=2200, Y= 1600 and Z=1500 mm, it can work parts on a Ø1600 mm circular bed of up to 6 tons and rotate at 450 rpm in lathing mode (10 tons in milling mode). The C-axis or rotation of the headstock with 45º plane executes a range of -15º/+195º, being able to work vertically or horizontally as well as in continuous movement. The main spindle, HSK A-100 of 32 kW can house any of the 120 tools available in the automatic change store. Despite the size and extension of the machine, noteworthy is its great dynamics with 40 m/min fast forward in X/Z and 30 m/min in Y, with 10,000 rpm rotation in headstock. Productivity improvement peripherals such as part and tool feelers, complete the equipment, offering high automation levels by means of pallet changes in agreement with the customer’s needs, for uninterrupted work. Its high technical specifications respond to the high demand of sectors such as aeronautics and oil & gas, but also for outsourcing due to the flexibility and possibilities it offers. IBARMIA, awarded the National Design Prize in 2012 continues working on this line to offer its customers the best and most attractive solution to their needs.